As more details trickle in about Walt Disney's Frozen, Cautionary Women could confirm that Idina Menzel would voice its villain, Elsa. Jonathan Groff and Kristen Bell have also pledged voice work for the film, slated for a November 2013 release. Frozen is beating a path last taken by Tangled, in which Disney animators spin fairytale yarn for 3D consumption. The tale in this case is The Snow Queen by Hans Christian Andersen, whose The Little Mermaid was made into an iconic Disney movie in 1989. 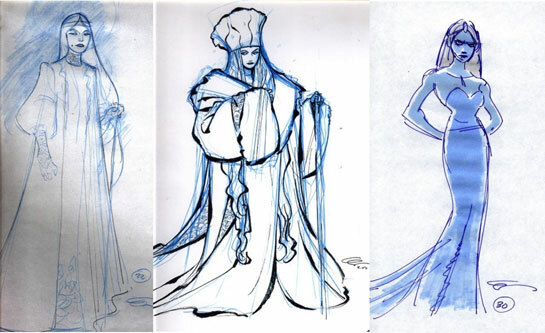 Disney-fying The Snow Queen had been in development refrigerator hell for years and years. The unnatural quality of the ice emphasizes this is not, you know, sky-made ice, but ice made by someone. In this concept art, Anna and Kristoff (Bell and Groff) are walking a desolation marked by icicles unnaturally oriented towards the east.